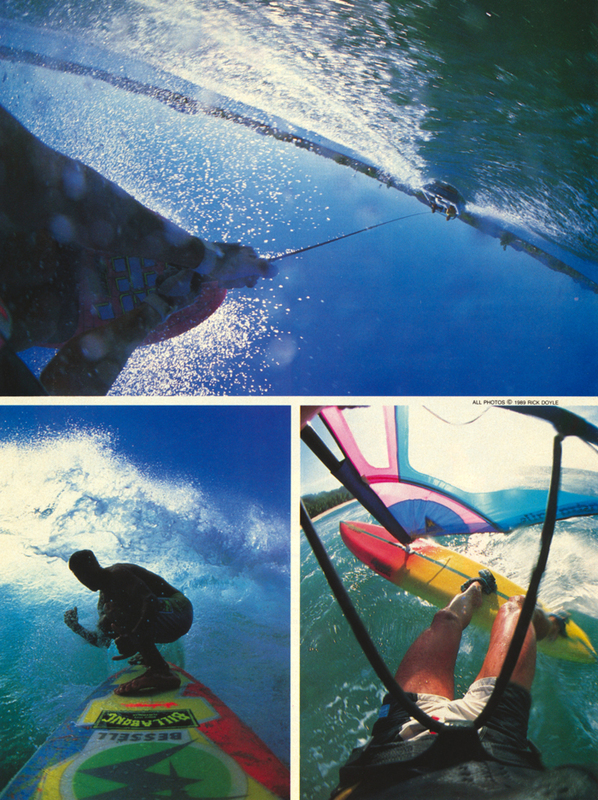 16 years before the first GoPro was sold, Rick Doyle and Tony Klarich created some of the first ski and helmet-mounted photos in water skiing. In 1986 Tony Klarich met Rick Doyle on one of the first photo shoots for Skurfer (one of the original skiboards by Tony Finn). Mike Murphy was the first dealer for Skurfer, and when it came time for photos, his place on the River was the perfect spot for Skurfer. Klarich was there, working for his uncle Mike, and was asked to ride for photos. During the Skurfer photo shoot Rick and Tony hit it off, so the next year they decided to team up for some creative photography with the waterproof housing Doyle had already mounted on surfboards and Skurfers in 1986. The plan was too mount the waterproof housing and camera on the front of a slalom ski. The camera and housing weighed well over 10 pounds, and it was challenging to ski with all that weight on the nose. The pictures are the first documented shots of a still camera mounted on a ski. The next year Doyle and Klarich decided to take it a step further with the helmet cam (story below). The helmet cam rig was a genuine Chargers helmet with about 15 pounds of camera gear mounted inside 2 counter-balanced water housings. 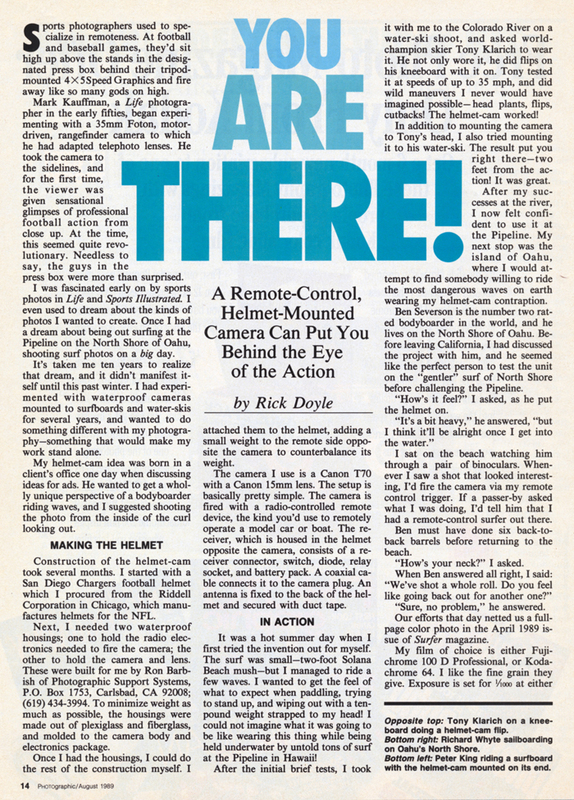 For both the helmet-cam and ski-cam Doyle used a remote control from the boat to take pictures – 36 images for each roll of slide film. After a few short minutes of skiing, it took about 10 minutes to take the housing apart, put in a new roll, then put the housing back together. In the days of real film, it was another week before they were able to see the slides. The images were groundbreaking in water skiing, and were run in magazines around the world.